collateral management — the selection of specific security issues to deliver as collateral and the maintenance of that collateral. There is also a fifth level of activity — the post-trade, pre-settlement affirmation of transaction details and settlement/payment accounts — but this also is not a useful way of differentiating repo activity. Telephone or electronic messaging systems. The use of telephones or electronic messaging systems is called direct trading, in that the technologies do little more than allow parties to communicate directly, by voice or in free-form text. Automated trading systems. Some voice-brokers operate networks of interactive screens. Dealers can enter prices directly and the voice-brokers can enter transactions that have been negotiated by telephone into the systems. These systems are automated but not automatic, in that transactions cannot be executed and settlement cannot be initiated and completed automatically by clicking on a screen. Additional action is required from the counterparties before transactions can be consummated, eg credit approval, further negotiation on terms such as collateral haircuts, and the despatch of settlement and payment instruction. HDAT, which is based in Greece and operated by the Bank of Greece; limited to Greek government bond repo; it suffered a collapse in volume in 2011, when the European sovereign bond crisis erupted. SENAF, which is based in Spain and owned by the BME Group, with a largely domestic membership; since 2011, it has seen no volume in repos. Uncleared — this would now be unusual for dealers, given that netting is a standard feature of repo master agreements. Bilaterally-cleared — a party nets opposite delivery and payments obligations separately with each of its counterparties, to produce a set of smaller residual delivery and payment obligations with each counterparty (one in each security and currency). 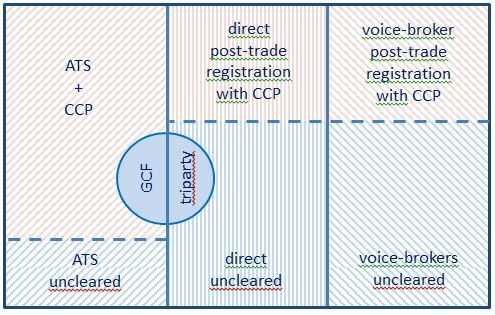 Multilaterally-cleared — at the inception of a transaction between member firms or shortly after execution, a central clearing counterparty (CCP) is inserted into the middle of each transaction to (1) become the high-quality buyer to the seller and the high-quality seller to the buyer and (2) net opposite delivery and payments obligations between itself and each member firm, resulting in one set of smaller residual single delivery and payment obligations between the CCP and each member firm (rather than a separate set between each pair of counterparties). CC&G, which is based in Italy but owned by the London Stock Exchange; its repo clearing business is drawn entirely from MTS and is limited to Italian government bond collateral. Eurex Clearing, which is based in Germany and owned by Deutsche Borse AG; it only clears repos transacted across Eurex Repo (which in turn only uses Eurex Clearing). LCH.Clearnet Ltd, which is based in the UK and part of LCH.Clearnet Group Ltd, which is majority owned by the London Stock Exchange; its repo clearing business covers a wide range of European government securities. LCH.Clearnet SA, which is based in France and part of LCH.Clearnet Group Ltd; its repo clearing business is in French government bond repo and, to a lesser extent, Italian and Spanish government bond repo; it operates a link to CC&G. CJSC JSCB National Clearing Centre (NCC) operated by the Moscow Exchange Group in Russia. There is talk of repo CCPs being established in the Nordic region (by Nasdaq OMX), Poland (by KDPW_CCP) and Spain (by Iberclear), but there is little evidence so far of substantive progress. Bilateral collateral management, in which the counterparties themselves select the securities in their accounts which are to be delivered as collateral in settlement or maintenance of a repo. Monte Titoli, the Italian CSD (whose tri-party system is called X-COM) — this service was launched in 2012, and is currently limited to collateral management with the Bank of Italy in support of ECB operations. Clearstream and Euroclear integrate their tri-party agencies with their securities settlement and payment services. Indeed, tri-party collateral management services are currently only available to the custody clients of the tri-party agents (who are CSDs, ICSDs and custodian banks), because of the close operational linkages needed between custody and collateral management services in order to operate a tri-party service. Where a tri-party collateral management agent is involved in the post-trade processing of repos, the business being supported is described as ‘basket trading’ or ‘cash-driven’ repo (as opposed to ‘securities-driven’ repo). This is because the parties negotiate only the amount, tenor and rate of the repo, and delegate the selection of collateral to the tri-party agent, who will automatically pick from the account of the seller one or more of the securities that are listed in a pre-agreed basket. The contents of baskets will have been agreed by the parties or, if the trading is electronic, defined by the ATS or, if transactions are being cleared, by the CCP. Basket trading is typically described as ‘GC repo’ (where GC means ‘general collateral’) and is also known as GC financing. However, many of the securities included in these baskets would not be recognised as general collateral in the wider repo market. 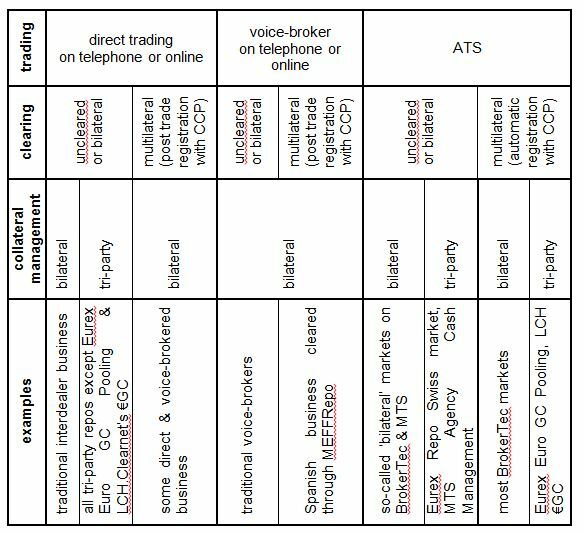 ATS + CCP + bilateral collateral management — this is the principal business model in Europe. BrokerTec and MTS link to several CCPs and allow the use of either ICSD or several CSDs, whereas Eurex Repo is exclusively linked to Eurex Clearing for clearing. Direct trading + bilaterally cleared + bilateral collateral management — this is the traditional pre-electronic market. ATS + CCP + tri-party collateral management — this is the GC financing model of Eurex Repo’s Euro GC Pooling Market and the market in the LCH.Clearnet Ltd €GC basket offered for trading on BrokerTec and managed by tri-party agent Euroclear Bank and Clearstream Banking Luxembourg. Note that it is not (currently) possible to trade directly with a party, then register transactions post trade with a CCP and outsource collateral management to a tri-party agent. Direct, which is connected to either bilateral or tri-party collateral management. Direct trading accounted for just over 52% of outstanding repo business measured by the ICMA survey in June 2013. Almost 10% was tri-party and another 9% was registered post-trade with CCPs. The ECB Money Market Survey suggested that about 19% of turnover over 2012 was traded directly and some 10% was tri-party. Voice-brokered accounted for under 15% of outstanding repo business measured by the ICMA survey in June 2013, and some 18% of turnover over 2012 in the ECB Money Market Survey. Electronic (ATS only). Electronic trading accounted for some 33% of outstanding repo business measured by the ICMA survey in June 2013. Just over 21% of the business was cleared across CCPs. The ECB Money Market Survey suggested that 62% of turnover in 2012 was traded on ATSs and 62% was cleared across CCPs. GC financing, in the form of Eurex GC Pooling, had outstanding business of about EUR 180 billion in June 2013 (there was little or no trading in other CCP-defined GC baskets), compared with a total of some EUR 1,060 billion for all ATSs. retail investors in Italy and Spain. Hedge funds access the repo market through prime brokers. These are divisions of large investment banks which offer funding, securities lending and other services such as execution, risk management, custody and settlement to hedge funds. Repo is a key funding tool. All parties transacting on ATSs and/or clearing across CCPs are currently dealers, reflecting membership rules and the scale of business needed to justify membership of these financial market infrastructures (two-way business in the case of CCPs). The voice-brokered repo business is also entirely interdealer. Tri-party repo in Europe is largely between, on the one hand, investment banks (as sellers) and, on the other hand, commercial banks, central banks conducting investment operations, multilateral development banks and money market mutual funds (as buyers or cash investors). Some central banks allow commercial banks to use tri-party systems to manage the selection, delivery and maintenance of collateral for monetary policy transactions (eg Germany, France and Italy). MTS-Newedge Agency Cash Management (ACM) platform, launched in 2012. Unlike the traditional RFQ model of other customer-to-dealer trading systems, ACM operates its RFQ as periodic auctions. Several times a day, potential buyers (cash investors) can request quotes for any cash they wish to invest. Sellers (borrowers) can make offers for the cash. An offer takes the form of a repo rate and one of over 30 pre-agreed collateral baskets. The contents of each basket vary by currency (EUR, GBP, USD and CHF), country and type of security and, in some cases, by credit rating or term (eg there are baskets of Italian government securities, UK corporate bonds rated at least A, European equities and US Treasuries). If an investor accepts an offer, the tri-party collateral management service of Euroclear Bank selects securities that are listed in the agreed basket from the account of the seller, delivers the securities to the buyer’s account and pays cash to the seller’s account, and then manages the collateral on behalf of the buyer for the duration of the repo. Bloomberg Repo Electronic Trading system, launched in 2005, is part of the Bloomberg Professional service, operated by Bloomberg LP. It is described as a customer-to-dealer multi-bank RFQ electronic trading system for repos. Tradeweb is part of Tradeweb Markets LLC, which is majority-owned by Thomson Reuters, with shares also held by Goldman Sachs, JPMorgan, Morgan Stanley, Citigroup, Bank of America, Credit Suisse Group, Deutsche Bank, UBS, Royal Bank of Scotland Group and Barclays. Tradeweb was launched in 1998 but has only offered a customer-to-dealer RFQ trading system in repo in Europe since 2011. Customers can request up to five quotes at one time. Collateral maintenance involves: regularly revaluing the collateral; calling agreed margin from or delivering to the other party, or performing agreed repricing/adjustments, when a material uncollateralised exposure arises or in order to preserve haircuts/initial margins; responding to the occurrence of income payments and corporate actions; and responding to valid requests for the substitution of collateral. This will certainly be the case in the EEA once MiFID II and the CSD Regulation have been fully implemented. At the moment, there are exclusive links between some trading venues, clearing systems, collateral management agents, and settlement and payment systems. For example, Eurex Repo’s Euro GC Pooling Market only connects to Eurex Clearing for clearing and Clearstream for collateral management and settlement/payment (although discussions being mediated by the ECB and ICMA’s European Repo Council (ERC) are taking place to allow ‘interoperability’, which means users of Euro GC Pooling would be able choose Euroclear Bank or another as an alternative collateral management agent). Access to some settlement systems is also difficult for foreign clearing systems. Settlements of securities transfers take place across the securities settlement systems (SSSs) operated by (1) domestic central securities depositories (CSDs) or (2) international CSDs (ICSDs), between accounts held and managed directly by dealers or, on their behalf, by agent custodian banks. The method of payment for securities depends on whether settlement is across a CSD or an ICSD. In the case of CSDs, the SSS is connected or integrated with the domestic large-value payment system operated by the central bank (typically operating on the basis of real-time gross settlement (RTGS) and often referred to as RTGS systems). In the Eurozone, the separate national central bank-operated payment systems have been replaced by the ECB-operated TARGET 2 payment system. In the case of ICSDs, the SSS is connected to several domestic payment systems, directly or through agent correspondent banks, but the bulk of the transactions settled by each ICSD are between its own customers, which allows transfers of securities and related payments to made internally, ie between accounts on the books of the ICSD. Many domestic investors prefer to hold accounts and settle at the national CSD, either directly or through agent custodian banks, whereas many dealers prefer to use an ICSD, as it allows them to concentrate the settlement of their cross-border and multi-currency business. The choice between direct use of national CSDs, as opposed to indirect use through agents and use of ICSDs, means payments are in central bank money, as opposed to commercial bank money, which raises issues about payment risk. Affirmation is performed by counterparties either (1) directly between each other by telephone or e-mail or (2) online across a third-party agent. Third-party affirmation systems with some repo functionality currently include Pirum (Systems Ltd) and the TRAX II service of Xtrakter Ltd, which is owned by MarketAxess Holdings Inc. The Euroclear Trade Capture and Matching System (ETCMS) performs a similar function for repos to be submitted to the central clearing counterparty (CCP), LCH.Clearnet. Note that affirmation is different from ‘trade-matching’ or ‘settlement matching’, which is the matching by a CSD or ICSD of settlement instructions received from two counterparties on the day before the settlement date. Affirmation compares a wider range of data than trade-matching (some of which is not necessary for settlement) and should take place on the transaction date in order to allow the maximum time for mistakes and misunderstandings to be resolved. Tradition is the interdealer broking arm of the Swiss-based Compagnie Financière Tradition. ATS can instruct central clearing counterparties (CCPs — see the section below on clearing) or (if there is no CCP involved) collateral management agents or (if there is no CCP or collateral management agent involved) CSDs/ICSDs, acting on the basis of powers of attorney given to the ATS by the counterparties. If CCPs are involved, they instruct collateral management agents or (if no collateral management agent is involved) CSDs/ICSDs on the same basis. If there is no CCP involved, collateral management agents similarly instruct CSDs/ICSDs. BrokerTec and Eurex Repo are classed as a Multilateral Trading Facility (MTF) under MiFID. HDAT is the Electronic Secondary Securities Market. It is classed as a Multilateral Trading Facility (MTF) under MiFID. MTS is Mercato Titoli di Stato. MTS Repo is the business name for the repo markets operated by MTS Group. MTS Group is controlled by MTS SpA, which itself is majority owned by the LSE Group. MTS Group operates MTS Italy, whose business includes repos in Italian government securities, and incorporates EuroMTS Ltd, a UK company, whose business includes repos in European government securities other than Italian. MTS Italy is a Regulated Market under MiFID. Euro MTS is called as a Multilateral Trading Facility (MTF). CC&G is the Cassa di Compensazione e Garanzia. MEFF is Mercado de Espanol de Futuros Financieros. MEFFClear was a central counterparty, but not a central clearing counterparty, in that it stood between parties as a high-quality buyer to every seller and a high-quality seller to every buyer, but it did not net mutual delivery and payment obligations. In addition to collateral maintenance (see footnote 1), delegated collateral management requires the agent to manage the substitution of any securities that: drop below the eligibility criteria of the buyer (eg due to a ratings downgrade); are due to make coupon or dividend payments (which may have unwanted tax consequences); are required by the seller in order to sell it off in the normal course of his business; have failed to be delivered; or can be replaced by newly-received securities that are of lower quality than the current collateral but still meet the eligibility criteria of the buyer (this is called ‘optimisation’). Collateral management agents also manage the life-cycle of the repo, eg refixing the repo rate on open or floating-rate repos. SIX SIS also classifies itself as an ICSD. Bank of New York Mellon is setting up a new ICSD. For example, Eurex Repo’s Euro GC Pooling Market trades two baskets containing about 8,000 and 23,000 ECB-eligible securities from about 20 countries, as well as some international (euro) bonds. About one-third are actively traded. The ICMA analysis is complicated by the fact that Eurex’s Euro GC Pooling and the trading of LCH.Clearnet Ltd’s €GC basket on BrokerTec are simultaneously tri-party and electronic repos.